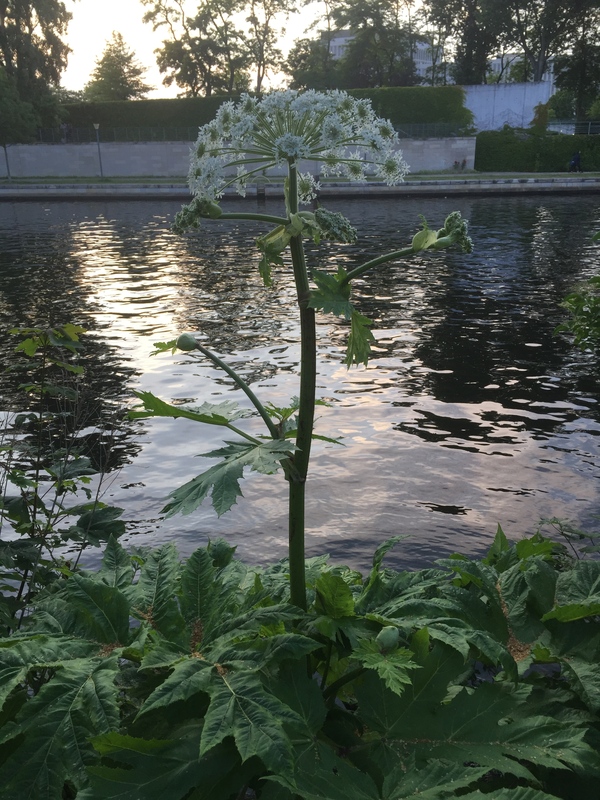 Berlin, Pfingsmontag, 16. Mai 2016 (dk) – Die Geschichte der Stadtentwicklung von Berlin ist eng mit Migrationsschüben verknüpft. Mal politischer Zufluchtsort und Fluchtpunkt, mal wirtschaftlich motiviert, aber auch Magnet für Wissenschaftler, Industrielle oder Künstler. Beinahe vergessen das Epizentrum der industriellen Revolution vor der alten Stadtmauer Berlins, die Stadtinsel Moabit, welche, von Wasserstraßen und Flüssen umsäumt, schon vor dem rasant einsetzenden Bevölkerungswachstum Mitte des 19. Jahrhunderts hugenottischen Familien und niederländischen Ingenieuren zur neuen Heimat wurde, welchen wir „typisch berlinerische“ Freizeitorte wie Schänke oder Datsche verdanken. Einen Ausflug in die Geschichte Moabits habe ich als Reiseführer vielen Besuchern der Stadt viele Jahre zu Fuß, im Bus und auf dem Rad geboten, dabei selber immer wieder laufend viel Neues gelernt. Vor einigen Jahren habe ich unter dem Aspekt der Wiederentdeckung dieses heute zentralen Stadteils historische Ausflüge für das englischsprachige Stadtmagazin „Exberliner“ unternommen, welches meinen nachfolgenden Report zuerst am 20. Juni 2011 unter dem Titel „Lost island, new frontier, veröffentlichte. Als Insel inmitten einer Stadt, die in harten Entwicklungsschnitten mal von Aufstieg, mal von Zerfall, von Flucht und Zuflucht, von Strafe und Kriminalität, Rausch und Experimenten geprägt war, schließlich den östlichen Grenzbezirk des britischen Sektors von 1945 bis 1989 darstellte, gerade zu ein Paradebeispiel für die Buccaneer – Seele, zumal an Land, doch von Wasser umgeben. Hier zur weiteren Ergänzung des Meinungsbildes rund um die Themen Flucht, Gentrifizierung und Migration noch einmal der damals verfaßte Text vom 20. Juni 2011 , hier auf buccaneer.zone, ergänzt mit gekennzeichneten Aktualisierungen im englischen Original. Mit freundlicher Genehmigung der Redaktion des Exberliner und Chefredakteurin Nadja Vancauwenberghe. Moabiter Kieze im Stadtteil Tiergarten im Bezirk Mitte zu Berlin. ©Karte: Bezirksamt Mitte zu Berlin. For many Germans, Moabit is a proletarian ghetto with a huge prison. For most expats, it is terra incognita (though they might have trodden its sandy soil on a dreaded visit to the Ausländerbehörde, believing they were in Wedding). Exberliner’s author Daniel Khafif explored the island ‘hood’s farthest flung corners and unearthed its hidden treasures. According to the prevailing theory of Gentrifizierung, a word Germans loath to pronounce as if its very sound were gentrifying the language, neighbourhoods fall like dominos to be rapidly overrun by espresso bars, bio shops and high rents. Fallen is Neukölln, last year’s new frontier, and hipsters are now invading Wedding. Of all the poorer inner-city neighbourhoods, only Moabit seems to be holding out. 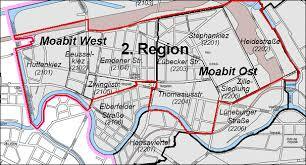 But is Moabit – those 7.72 km2 between Mitte and Hauptbahnhof in the east and Charlottenburg to the west – destined for the same fate? Unbeknownst to many, Moabit is an island, a mound of sand on a former swamp surrounded by the Spree to the south, harbours and canals on the other sides. First to settle the swampy area were Slavic tribes who forded the Spree, linking up trade routes. From the 13th century, Brandenburg nobles used the heath as a hunting ground. But it was the refugee French Huguenots who settled here after the end of the War of the Spanish Succession in 1715 who made the place livable. The origins of the name ‘Moabit’ are disputed. The French protestant refugees may have seen parallels between their fate and that of the Moab tribe who fled Egypt to settle the desert east of the Dead Sea. It could also have evolved from terre maudit, old French for ‘cursed land’ or the old Berlin word, Moorjabiet, meaning ‘swamp’. The Huguenots tried to grow mulberry trees to cultivate silkworms but failed because of the bad soil. In the 18th century the military used Moabit as a parade ground called the Pulverwiesen, because of the nearby gunpowder factories. Blick auf das nördliche Spreeufer nach Moabit, vom Haus der Kullturen der Welt, Tiergarten. ©Foto: Daniel Khafif, 2015. After the defeat of Napoleon, Prussia expanded and Berlin boomed. Moabit’s harbours flourished with imports and exports and attracted labourers from Westphalia, Saxony, Holland, the Baltic countries and Poland – which is why the borough is still quite Catholic. In 1869, the Dominican Order opened the St. Paulus Monastery, the first new monastery in Germany since the Reformation. Today, the church attracts mostly Polish worshippers. Moabit was ground zero of Berlin’s rapid industrial revolution. Germany’s biggest firms expanded, building huge factories in the neighbourhood: AEG, Borsig, Siemens. The factories manufactured trams, trains, electrical goods and weapons as the Kaiser armed Germany in the run-up to WWI. It was in Moabit that the architect Peter Behrens built Germany’s most famous example of modern industrial architecture – the AEG Turbinenhalle – in 1909. By 1910, the population of the former wasteland had grown to 190,000, up from 6000 in 1861. Proletarian Moabit became known as a hotbed of crime, prostitution and disease, replete with lively taverns and a red light district: tuberculosis, cholera, herpes and smallpox skyrocketed! No wonder the virologist Rudolf Virchow was brought in to construct one of Berlin’s largest hospitals. At Krankenhaus Moabit, Robert Koch discovered the tuberculosis bacteria and developed TB – therapy, in cooperation with collegaue Paul Ehrlich. The Treaty of Versailles strangled Berlin’s industry and the inflation of 1922-1929 devastated working-class livelihoods. As in Wedding, laid-off Moabit workers joined the ranks of the communists and took to the streets – clashing frequently with the Nazis, whose popularity was also rising. Under Hitler, many intellectuals and leftists were shipped to Moabit Prison, including Albrecht Haushofer, who wrote his Moabiter Sonette poems there before being executed by the SS along with other victims on April 23rd 1945, just days before the fall of Berlin to the Soviet army. The war reduced most of the district to wasteland. The rubble of the military complex now forms the hillocks of the Fritz-Schloß-Park. Just 50,000 people remained in Moabit, mainly refugees from the East. Gypsies, Poles and Jews had emigrated, been deported or murdered. When the Berlin Wall went up between Moabit and Mitte in 1961, it fell into a slumber. The eastern end, hosting a massive prison and cut off by the Wall, was unattractive to most. Only artists, students and countercultural types could be attracted by such a dead end. In 1968, Germany’s most famous WG, Kommune 1, set up in an abandoned loft on Stephanstraße. In the 1980s, Moabiters discovered a new local pride when activist granny Klara Franke successfully fought off construction of a new inner-city Autobahn with the help of punk squatters. When the Wall fell in 1989, students and artists left to explore the new East. Rents dropped even further. In 1999, just 66,000 people lived in Moabit: Turks, the elderly, day-release prisoners, ex-cons, junkies and a few forerunners. Dr. Motte and Danielle de Picciotto founded the Love Parade from an office in Rathenower Straße and star Anglo-German architects Sauerbruch Hutton set up shop in 1993 in former Prussian barracks, where some 90 designers now toil away on projects around the world. In the same complex, the Zero Film production company churns out German indie successes like Blackbox BRD. Gentrification: is the clock ticking? To many Germans, Moabit is still a sore on the body of Berlin, a black hole in the heart of the city, filled with crime, immigrants and poverty. Yet since the opening of the glittering Hauptbahnhof and reconnecting of the S-Bahn ring in 2006, the island parish has regained its centrality and townhouses, malls, hostels and hotels have been sprouting from the soil. The old market hall has been spruced up. Slowly but surely, cafes and decent restaurants are infiltrating the borough. Over the last few years, a totally new gallery district emerged from the concrete on Heidestraße behind Hamburger Bahnhof. And the Premium Spa VaBali opened its Waterworld for Wellness – fans (updated by author) But the district has a long way to go. The island society is split into the haves and the have-nots by the Kleiner Tiergarten park. Westlicher Teil des Kanzleramtes, Grenze Moabit, südliches Spreeufer. ©Foto: Daniel Khafif, 2015. 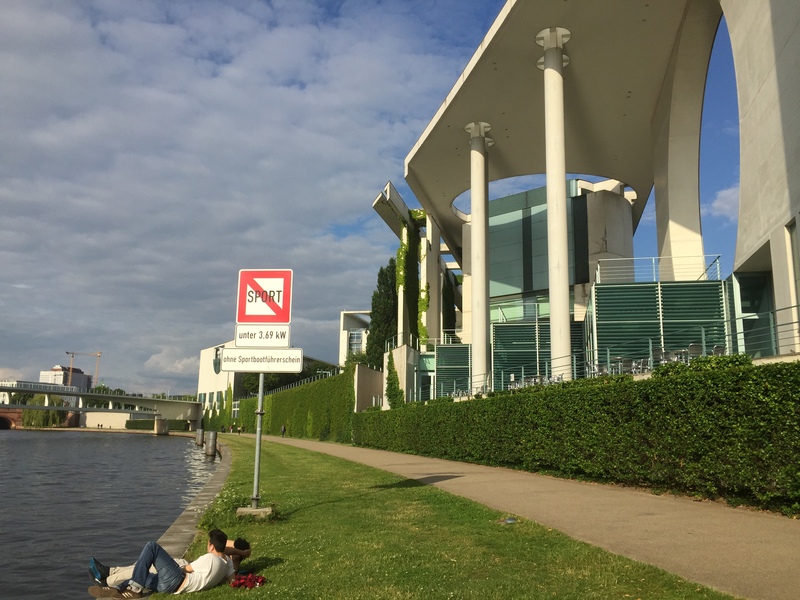 To the south: the glittering Federal Ministry of the Interior on the Spree banks, bourgeois Gründerzeit flats, the Bobo restaurants and coffee shops of the Essener Kiez. (update by author: now moved to Invalidenstraße, near the famous restaurant „Paris – Moskau“, a real institution in Moabit, not far away from Hauptbahnhof ah the old borderline to the Soviet Sector which just a few years ago was still wasteland and before WWII the old ULAP field, one of the first air – show – fields. To the north: the prison, police barracks, döner shops, slot-machine ‘casinos’, shisha bars, forlorn Eckkneipen. Here on leafy side streets, countless empty storefronts are zu vermieten – fertile ground for the flighty ‘projects’ of the young and daring looking for an alternative to Weserstraße’s No-kölln. In the last five years, the Moabit population (now 76,000, 17.000 more than 1999, update May 2016 !) and its rental prices have been inching upwards, but remain strikingly affordable. 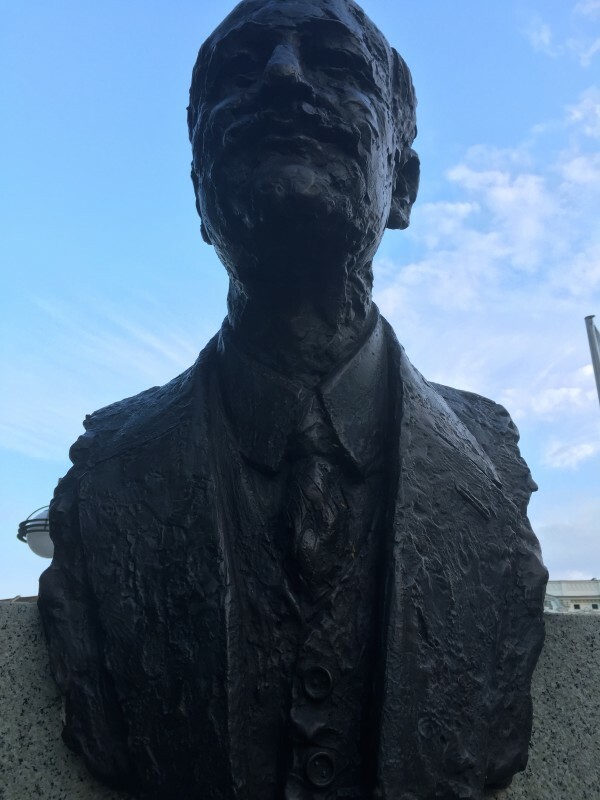 Paving the road for upcoming pioneers and new settlers, Exberliner reporters embarked on an exploratory voyage: they travelled the depth and breadth of the island and unearthed hidden gems. Some never came back to the mainland. Slowly but surely the lost prison island is making a comeback: for better or for worse, Moabit is integrating into the New Berlin.